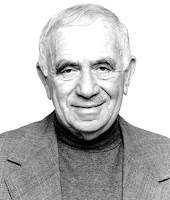 Yehuda Amichai is a famous Israeli poet (1924-2000) who embraced the instability of the postmodern movement. His poems reveal the self-awareness and dearth of simple answers that the postmodern movement is often known for. During a unit on postmodernism during which my students discussed White Noise and became acquainted with works from the postmodern era, I thought it would be interesting for them to see how a secular Israeli contributed to postmodernism. Following the poems, though, is an excerpt -- with a link to the full text -- of a speech on messianism by Rabbi Lord Jonathan Sacks. 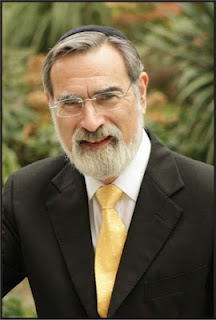 Rabbi Sacks addresses what it means to be a religious person in a postmodern world and the role that Judaism has played in filling the chasms left by any philosophies which are nihilistic. Thanks to my student Penina Warburg for locating this article for our class. How do we respond as Jews to the lack of clear narrative in the postmodern meta-narrative? * Philosophy is about impersonal truth. Judaism is about personal truth. * Philosophy is about detached observation. Judaism is about engaged participation. * Philosophy is about a single ideal picture of the world. Judaism is about the irreducible multiplicity of perspectives. * Philosophy searches for truths that are universal. Judaism articulates truths that are particular. * Philosophy is about the discovery of harmony. Judaism is about cognitive dissonance. * Philosophy is about the truths that we see. Judaism is about the truths that we hear. * Philosophy is about truths thought. Judaism is about truths lived. * Philosophy sees knowledge as cognition. Judaism sees knowledge as relationship. * It follows that if philosophy is about the conquest of ignorance, Judaism is about the redemption of solitude. You know, one could go on and on about those differences but it seems to me that those are just a few – and probably enough – to show you that there really is something fundamentally different about the way Judaism relates to the world and the way Plato and Descartes and their followers did, and that it is too little understood and far too little studied. Now the important thing about cyclical time is that it has a philosophy to it. Namely, that beneath all these changes that we see in nature and even in the human life cycle from birth to youth to maturity to decline and death and the new birth – all of those record changes beneath which there is an underlying order. Things actually don’t change. The cast of characters changes but cyclical time is time that endlessly repeats itself. And that is the philosophy behind the world of myth. It is the philosophy behind the world of philosophy. And it is the philosophy behind the world of science. Myth, science, are both different ways of discovering an unchanging order beneath the apparent chaos. [C]yclical time [is] a world of eternal recurrences and that is the world that never changes and, to a certain extent, halachah, Jewish law, certainly as it relates to ben adam lemakom – to our relationship to God – Jewish law, in that sense, does not change. To ask a question of whether something is kosher or treif is, I think, more or less guaranteed to be fairly similar whether you ask the question in 2001, 1001 or 3001. I think so. Although the person who taught me for smichah always used to say, ‘Whatever it is, eat it today because tomorrow it will be treif’! That is cyclical time. And in that we claim no originality. We borrowed that from other time. That is cyclical time. Anyway, this particular time I am going to call – because most people call it that and I am going to do so by way of shorthand – this time is called ‘linear time’. And the Torah has a marvellous way of fixing the moment when linear time begins. When God says to Abraham, Lech lecha me’artzecha mimoledetecha mibeis avicha el ha’aretz asher erecka – Leave your land, your birthplace and your father’s house and go to the land which I will show you, that is the birth of a concept of time as a journey. Time as a way of travelling towards a destination. Time as a narrative that has a beginning, middle and an end. That is a revolutionary concept of time born in Judaism and a very important one indeed. That, I think, is actually at least a little fragment of the truth because God was telling Abraham to leave behind all the things that determine our future. That seem to suggest that we have no choice in what we become, that are deterministic. And He is saying to Abraham: Leave that world and embark on a journey of radical freedom. Now, the question is: Why? What was it about Judaism that allowed Jews to come up with or to hear or to respond to this radically new concept of time according to which the future does not endlessly recapitulate the past? And the answer, I think, is simple. Here it is. Until Judaism, God had been seen in nature. With Judaism, for the first time, God is seen as above, or beyond, nature. If God is above nature, then God is not bound by nature. In other words, God is free. In other words, what is interesting about God and important about Him, is His choice, His will, His creativity. God chooses – asher bochar bonu micol ho’amim etc. etc. – God wills. Veyomer elokim yehi – God said, “Let there be”. God creates. Bereishit barah. Those are the key things about Judaism and you cannot find them in the universe of myth because choice, creativity and will are aspects of a Being that is somehow above nature, not determined by natural laws. It therefore follows that if human beings are betzelem elokim – they share the image and the nature of God – then we too, for the first time, were able to see ourselves as beings with the capacity to choose, to will and to create. And that remains the single most striking – and I think most controversial, even to this day – of Judaism’s assertions. Anyway, every attempt to reduce human behaviour to science or to pseudo-science is a failure to understand the nature of human freedom, of human agency, of human responsibility. A failure to understand that what makes us human is that we have will, we have choice, we have creativity. Every single attempt – socio-biological, genetic etc., and they are published by the hundred every single year – represents the failure to distinguish between a cause and an intention. Between phenomena whose causes lie in the past: those are scientific phenomena – and human behaviour, which is oriented towards the future. A future which only exists because I can imagine it and because I can imagine it I can choose to bring it about. That is in principle not subject to scientific causal analysis. And that is the root of human freedom. Because human beings are free – therefore we are not condemned to eternal recurrence. We can act differently today from the way we did yesterday – in small ways individually, in very big ways collectively. Because we can change ourselves, we can change the world. And in that capacity, to change the world, cyclical time is transcended by linear time which says that because I can change, the world can change, and therefore I can move from where I am now to where I would like to be ultimately. That is where linear time is born. That is where hope is born and that is the incredible concept, the Jewish drama of redemption. Now, I just want to give you a ‘for instance’ of the difference that makes, and here it is. If I were to ask you: What is the greatest contribution of the Greeks to literature? What genre? – what would you say. Tragedy? Yes. Exactly. That is the unsurpassed achievement of Sophocles, Aeschylus and the rest. Tragedy. Now tragedy belongs to cyclical time. It takes a very specific view of the world, which is that the world is fated more or less to remain the same. That is called moyra. That is called fate. And every belief that we have that we can somehow resist fate is what the Greeks called hubris and is punished by nemesis. All our dreams of changing the world are destined to be shipwrecked on the hard rocks of reality. What is the Hebrew word for tragedy? There isn’t one, actually. Gevalt! You know how many words are missing from the Hebrew language? I’m sorry – again, I’m a little bit jetlagged. I’ve just come back from doing a big public dialogue with the Israeli writer Amos Oz and that was under the Chair of Judaism and Civility. And the fascinating thing is that when they came to translate that to Hebrew – [laughter] – they discovered there is no Jewish word for civility. There actually isn’t! They were in trouble! They came up with two alternatives: one was derech eretz; one was ezrachut. One means respect; one means citizenship. But there is no Jewish word for ‘civility’. But I should have known that. Anyway, what is the Hebrew word for tragedy? Exactly! Tragedia! They couldn’t find a word for it. There is no Jewish word for tragedy because Judaism is the principled rejection of tragedy in the name of hope. And I find this extraordinary, that despite the many tragedies of Jewish history, there is no word. There are words for catastrophe. There’s a word like asson. There’s a word like churban. We have even borrowed a word from sacrificial stuff and use the word shoah. But not one of those words means what the Greek tragedy is about, namely bad things that happen because of the innate structure of reality which is fundamentally blind and deaf to human hopes and aspirations. There cannot be a Jewish tragedy. You can’t write it. It doesn’t translate. 1. Human free will – because we can change ourselves, we can change the world. 2. The very structure of reality. Reality is not blind. It is not indifferent to us. It is that at the very heart of it there is a Presence, a Being, a Thou – Who cares, Who wants us to be here, Who assures us that our aspirations are not destined to fail. 3. And because of those critical tragedy-destroying concepts that we speak of ten days in the year, between Rosh HaShanah and Yom Kippur, the concepts of teshuvah and kapparah. I say I am sorry about the past and I am forgiven for the past. And teshuvah and kapparah between them help to ensure that no past determines our future. If we are sorry for the past and we are forgiven for the past, we have a new slate and we can begin again. No world in which teshuvah and kapparah exists has room for the concept of fate or tragedy. So, as a result, the most striking thing Judaism ever taught the world was a concept of time which gave rise to the possibility of hope – and thereby gave the West an alternative to Greek culture, namely to tragedy. An alternative to tragedy as the meta-narrative of the human condition. And you will understand that what makes linear time different from cyclical time is that linear time is about history, whereas cyclical time is about nature. Cyclical time, I said, belongs to ish hahalachah, to the halachic mind. Linear time belongs to the ish nevuah, to the prophetic mind. And it signals that there can be real change in the course of human affairs, not superficial change but deep substantive and structural change. And that, of course, constitutes the third great belief of Judaism: creation, revelation. This is the belief in redemption. Now the difference between linear time and cyclical time – and let me just say it in slightly different words – is the difference ultimately between seeing the truth as a system and seeing the truth as a story. It is the difference between the platonic concept of philosophy as revealing timeless truth – and Torah, which is not a book in its prophetic aspect of timeless truth. It is a book about the realisation of truth through time. Now the closing chapter of that story is of course yamot hameshiach – the Messianic Age. And, of course, what the Messianic Age is and what I am supposed to tell you tonight – I frankly give up on completely because it is one of the most hotly-debated topics in Judaism and you don’t want to know my views about it. However, what you can say without shadow of doubt is, in answer to the questions ‘Has Moshiach come?’, the Jewish answer is ‘Not yet’. However, in that very ‘not yet’ are two monumental assertions. And this is what I want to say. 2. The other thing is that when we say ‘not yet’ but will we still say, im kol zeh echakeh lo bechol yom sheyavo – af al pi ken – we still await him daily – is the refusal to accept the second alternative which is the world we inhabit today which is the world of Postmodernism in which there are no ultimate meanings. Postmodernism is the rejection of the redemption narrative. “Postmodernism”, says Jean-Paul Lyotard, means the distrust of meta-narratives.” “Postmodernism,” says George Steiner in his latest book “Grammars of Creation”, “is the eclipse of the Messianic.” And we say: No. We do not say the ultimate meaning is the world we live in today where meanings are essentially private, whether they be therapeutic, Buddhist, New Age or any other alternative. We say that the meanings of our world are not private: they are shared. They are something we call the common good. And that means that we absolutely reject both those who think that salvation has come or is within reach and those who say there is no such thing. What is at stake in this Messianic narrative? I will tell you. What is at stake in the prophetic consciousness, the ish nevua, the linear imagination, the Jewish meta-narrative of redemption, I have here to differ to a man who put it so much better than I could – the non-Jewish writer Paul Johnson. This is what Paul Johnson says in the beginning of his book on Jewish history – and it is so true and so beautiful and here it is.